Is the best blog in publishing written by a 60 year- old former editor-in-chief of Marvel Comics? I think so. How are sausages made? When I wrote my first book I had no idea. A few years down the line I now have an inkling. Of course publishing is like any business, all of human life is there, but who will speak about the incompetence, nepotism, timidity and general zero budget drivel that flourishes behind the scenes? Well, nobody, because it’s a small world and everybody wants to keep their job. In particular, very few people who have worked at the top are willing to open their mouths and risk everything because they have so much more to lose. Forget about comics for a second and realize that Shooter was editor-in-chief of a mini-Disney, a publishing house that owned major intellectual properties worth millions in licensing, toy and movie/TV rights. He was an executive alongside other executives, some of whom openly took pride in declaring that they “never read the books,” but only saw them as lucrative cash cows to be milked for all they were worth. Shooter however viewed publishing from both sides of the desk- he had begun as a writer and later as supreme editor he interacted with the creative personalities who provided the concepts for the suits to exploit. One of the reasons he became a pariah is because he didn’t mince words about work he considered shoddy (nothing has changed in that regard). Since his first post in March 2011, Shooter has explained with remarkable candor everything from magazine return policy scams of the ’70s and ’80s, to the ins and outs of licensing, how to start up your own comics publishing firm, how to deal with the toy business, getting your properties on TV (or not), how to raise millions of dollars and especially how to lose it all again… and so much more. He even revealed a scam one of his employees had concocted to steal pocket money from small boys. Here’s something else I learned from Shooter- “Little Golden Books” pay excellent royalties (he has written two). In fact, as several of his ventures crashed and burned in the 90s, it was the money from Baby Animals on the Farm and After the Dinosaurs that kept him alive. Now how can I get that gig? Although Shooter’s site began as an exercise in autobiography, he soon responded to requests from readers to review comics. 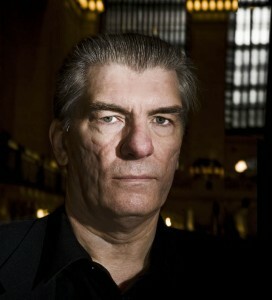 His editorial critiques cover every aspect of a book, from the design of the logo to the art and story, i.e. they are not impressionistic ramblings but rather close analyses that pay attention to pretty much every aspect of production. The first subjects of his critical scrutiny were Catwoman and Red Hood and the New Outlaws two particularly execrable titles that were released as part of Warner Bros subdivision DC’s ultra-gimmicky “New 52” re-launch last autumn. In order to address drastically declining sales, DC executives decided to reboot and renumber all of their titles, starting everything all over again from issue #1, even though this is one of a very limited number of marketing ploys the comics industry has been beating to death for the last 20 years, with perpetually diminishing returns (another is killing off a major character, only to bring him back to life months later). Such marketing tricks deliver a brief spike in sales, which is always followed by rapid decline. One of the problems, made manifestly clear in Shooter’s reviews, is an almost total collapse of storytelling standards at the major publishers. As monthly comic sales decline, so the business of collected “trade paperbacks” has become more important. The stories are still serialized first, but writers tend to think about the collection and thus no longer bother to inform readers who the characters are or what’s going on in each monthly instalment, instantly alienating anyone who has not spent the last twenty years immersed in geek lore. This astounding lack of commercial and storytelling sense is, apparently, endemic. Shooter’s patient and detailed critiques offer the reader much to ponder, and are often much more interesting than the comics under review. All those other editors in the world who can’t be bothered to edit should pay attention (the problem is not unique to comics, of course). Since Shooter has been in the business for nearly 50 years he has worked with almost all the greats of the medium. His reminiscences will make little sense if you don’t know your Jack Kirbys from your Steve Ditkos, but if you do then you are in for a lot of fun. I have particularly fond memories of The Great Kirby War of late 2011, when a furious row broke out in the comments section. Surprisingly it was not about Shooter and Marvel’s highly controversial tussles with Kirby over various legal/ownership issues (the other reason he became a pariah), but rather the merits of an inker named Vince Colletta. The question was: did Colletta butcher Kirby’s work when he erased or altered details in the original pencilled artwork, or was he improving cluttered panel layouts? Who cares? You might ask. Well, lots of people. The problem is that Kirby — artist/designer/co-plotter on Fantastic Four, Thor and many others- is increasingly revered almost as a semi-divine figure not only by marginal collector types but also by the likes of prominent cultural figures such as Jonathan Lethem. In the eyes of such acolytes, tampering with the work of “The King” is tantamount to heresy, even if Colletta was doing so when Kirby’s art was regarded as ephemeral fluff for kiddies. It’s been almost 20 years since I read superhero comics, so I was amazed to discover the scholarly subculture that has developed around Kirby, the passionately held views, the anathemas pronounced against Colletta, and the existence of publications which meticulously analyse his pencilled pages vs. the inked versions. 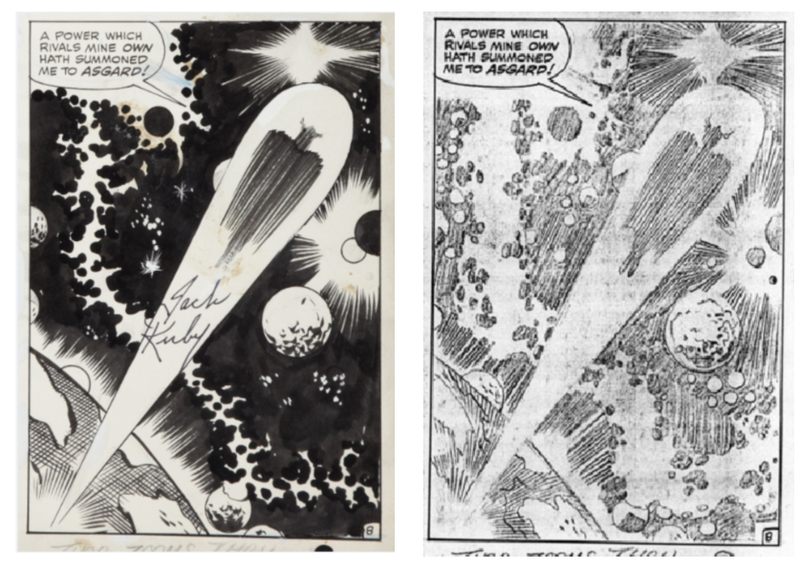 (For the record, of the examples I have seen, Colletta’s changes definitely improved the layouts, although I don’t doubt his tampering was infuriating to Kirby). Finally, Shooter is incredibly generous. In addition to all of the high quality content listed above, he uploads examples of his full scripts online, plus movie treatments, lectures on the art of storytelling, images from his vault and much, much more — and it’s all free. Many of the regulars on the comment threads also add value (the site only occasionally gets bogged down in tedious internet blather about God and politics), and his site administrator JayJay Jackson does a great job keeping it all in order. The content is so rich, its implications spiral off in many directions. For instance, during a particularly contentious series of reviews of DC’s revamped Wonder Woman, Shooter returned repeatedly to the idea (entirely neglected by the comic’s writer) that every issue is somebody’s first; i.e. you should make sure there is enough information for new readers to follow the story. Obvious enough, and yet in the cultish world of superhero comics they don’t do this much anymore, preferring to commit commercial suicide by writing exclusively for the dwindling fan base of men in their 30s and 40s. Shooter’s point however made me think about the world of politics, and in particular recent events in Russia, where I lived for ten years. How many foreign correspondents bother to ground their reports in a meaningful context that enables the reader to actually understand what’s going on? Precious few, I thought. Then there are all those “experts” who by contrast write as if the reader has a PhD in International Relations. Thus, inspired by Shooter’s critique of Wonder Woman (a superhero I didn’t care about even when I was a collector), I wrote a beginner’s guide to Russian politics for the international website of RIA-Novosti, the Russian state news agency. Could anyone have guessed what lay behind the piece? No. But the truth of Shooter’s argument applies to any topic; his arguments resonate outwards. So those are my four reasons. There are many others. Fundamentally though, Shooter is a good storyteller. He’s clear; he’s witty; he writes good prose; he knows what’s important; and he knows exactly when to get in and when to get out. In short, www.jimshooter.com is — to me at least — the best publishing blog in the world. DISCUSS: How to Get Ahead in Publishing: Be Bold or Be Bland?